4.8 out of 5 based on 380 ratings. Starry Night over the Rhone Painting (September 1888) is one of Vincent van Gogh works of Arles at night; it was painted at a spot on the banks of river which was only a minute or two's walk from the Yellow House on the Place Lamartine which Van Gogh was renting at the time. The Starry night sky and the effects of light at night provided the subject for some of his more famous paintings, e.g. The Starry Night Painting. Or other version Painting over the Rhone.The challenge of painting at night intrigued Van Gogh. 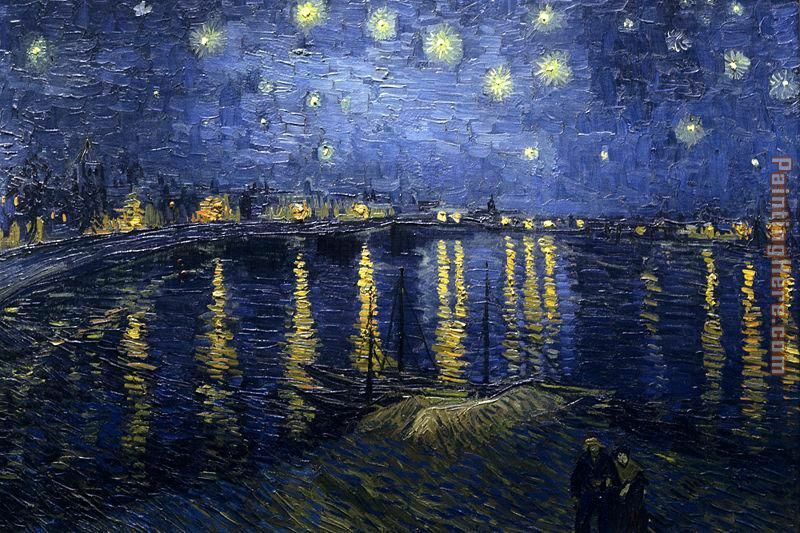 The vantage point he chose for Starry Night over the Rhone allowed him to capture the reflections of the gas lighting in Arles across the glimmering blue water of the Rhone. The sky is illuminated by the constellation Ursa Major (the Great Bear). In the foreground, two lovers stroll by the banks of the river. Beautiful, original hand-painted artwork in your home. Interpreted paintings based on the masters' works of Vincent van Gogh.This Starry Night over the Rhone needs about 14 - 16days for production by a talented artist. If you're not happy with Vincent van Gogh Starry Night over the Rhone that you made on PaintingHere.com, for any reason, you can return it to us within 50 days of the order date. As soon as it arrives, we'll issue a full refund for the entire purchase price. Please note - PaintingHere.com does not reimburse the outgoing or return shipping charges unless the return is due to a defect in quality. If you want to purchase museum quality Starry Night over the Rhone at discount price, why not give us a try? You will save a lot more! This Vincent van Gogh Starry Night over the Rhone needs 14 -18 days for production time frame. We ship all over the world. We can provide Starry Night over the Rhone Painting stretched canvas and large framed art.